Who: Alexandra Monir, author of YA time travel paranormal romance novels in the Timeless Series of books. When we were approached to host Alexandra on our blog for Smugglivus, we were thrilled (hey, it finally gives us an excuse to get Timeless off the TBR!). Recent Work: Alexandra’s upcoming book is Timkeeper, the second in her ongoing Timeless series of paranormal time travel YA. Here to talk about her new book, please give it up for Alexandra, everyone! Writing the sequel to Timeless felt like going back to school: I got to return to a familiar environment, reconnect with old friends—and I learned so much! I feel I “grew up” as a writer on this book, and that makes it even more special to hold the final product in my hands and share it with all of you. When I wrote Timeless, there were so many concepts in my mind that I was eager to explore: the idea and intricacies of time travel, the possibility that someone’s true soulmate could exist in another time, and what it was like to grow up and come of age in different eras than my own. I knew I wasn’t done when I finished Timeless—even as I turned in my copyedits, my imagination was filled with all that lay ahead (or in the past!) for my protagonist, Michele. So when I got the green light from my publisher to start writing a sequel, I couldn’t have been more thrilled! With Book #2, I was able to delve deeper into all aspects of the Timeless world. Below are the three things I’m most excited about in the story of Timekeeper. My favorite part of writing the new book was developing the secret underworld of time travelers, known as The Time Society. Creating the mythology and rules of the world was some of the most fun I’ve ever had as a writer! The Society’s story is closely linked with that of the villain, who plays a huge role in this book—and has affected Michele’s life and circumstances since before she was born. 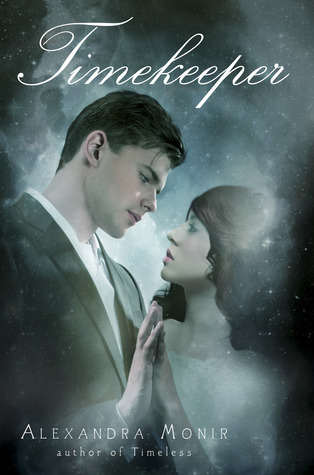 Timekeeper is where Michele learns about the dark force that has haunted her life. I discovered that I really enjoy writing the darker, more suspenseful storylines. I can’t say too much about this without revealing spoilers, but suffice it to say that we get his side of the story, and it was my absolute favorite part to write! There is a pretty big twist to their relationship in Timekeeper. I can’t wait to hear what the readers think of it! I hope you have as much fun reading Timekeeper as I did writing it. J I love hearing from readers, so do keep in touch and let me know your thoughts! Check out the Timekeeper trailer and official facebook page for more info.